I didn't get a chance to write a thankful post with our crazy Thanksgiving weekend. We went out of town to be with family and in those few days, managed to have Thanksgiving with a lot of extended family on my hubby's side who we haven't seen in awhile, take Bridals for my sister-in-law (they are beautiful, wait until you see them), get ready for and attend that same sister-in-law's Bridal shower, get our own family photos taken (what a crazy endeavor that was), go on two fly-fishing outings (hubby, Q and Grandpa), play in a Turkey Bowl (hubby and brothers), see the Temple lights, travel to the mountains to play in the snow and cut down a Christmas tree, and strap it to the top of our van Griswold-style, harvest rutabagas with my dad, watch the kiddos ride horses, do a little Christmas shopping and go on a date with my hubby. Plus we stayed up late chatting with all sorts of family members and ate copious amounts of turkey sandwiches and pie. Yum. So now I am sitting down to finish my thankful post that I started a week ago. And catch up on emails. Ahem. I have been thinking a lot about how thankful I am for my kids. Even though they drive me up the wall and absolutely and completely batty, I am still thankful for them. Life would be really boring without them. Especially the holidays. I am always reminded of what fun they make everything (albeit harder too) around the holidays. I am thankful for the little boy that drops peas in his milk at dinner and says, "Peath can thwim". I am thankful for almost everything that comes out of his mouth lately...it keeps all of us laughing. A few days ago I made him a sandwich for lunch and cut it into squares. He got upset that I only made a half a sandwich and that I had the unmitigated gall to cut it into squares. He then started to cry and complain, getting increasingly louder. Finally he sobbed, "I'm cwying cuth I don't have any thoice (choice). I don't know how to eat thquares!" Apparently he was tired, and gosh, I don't know about anyone else...but I found it so extremely humorous and tried hard not to laugh out loud (I may have a little though). I am a quite worried about him growing up and not saying funny things anymore. Today he told me he wants to be a big kid and go to school and make his own peanut butter and jelly sandwiches all by himself. Then he paused and said, "But then who will be your baby"? Sigh. That about did me in. 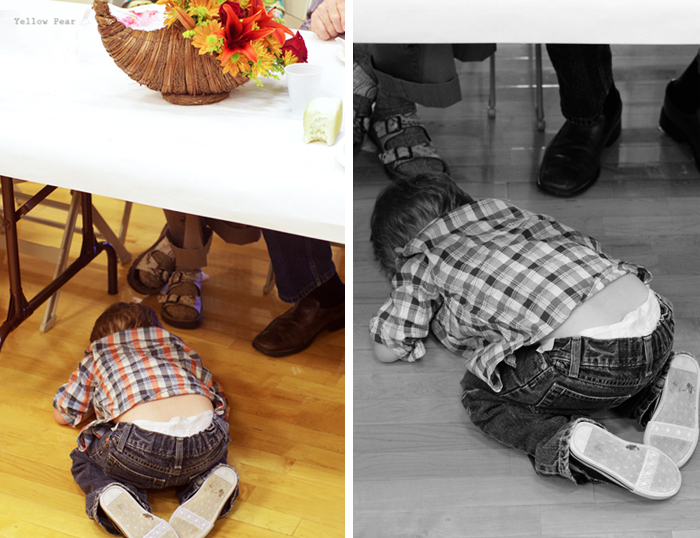 And I am very, VERY thankful he fell asleep under the table at Grandpa's feet during Thanksgiving. It allowed us a very nice break, a relaxing meal and some uninterrupted conversation. We did move him to a couch so he wouldn't have some weird aches and pains later. I am also thankful for my biggest boy who loves to read so, so much that he is constantly adding to his ever-expanding vocabulary and keeps dropping new, big words every other minute...sometimes not knowing their correct pronunciation. Like the other day when he was vacuuming the hall. He asked how he was supposed to vacuum with all the "deb-riss" in the way. I responded with, "What's debriss?" He said incredulously, "You don't know what debriss is?" I replied a bit sheepishly, thinking he had surpassed my vocabulary knowledge at the young age of 9, "No I do not know what debriss means." "It means rubble... you know...."
"But it has an 's' in it...."
"Yeah but it's a silent 's'." I love it. It reminds me of when I was a kid and thought facade was pronounced fake-ade for quite some time. And I had some trouble with annihilation. I could have thought it was pronounced an-hill-ee-a-shun. Or something. Maybe. I'm thankful for my oldest. She is learning and growing so much. I am amazed at her creativity daily. She is a fabulous babysitter too. She has a prize bag for the kids she babysits and brings crafts or activities...all of which she came up with on her own. She also cleans and makes dinner for me. Plus we have an in-house babysitter. It's awesome. We finally go on a weekly date. Amazing. I can't believe how old she is and how much of her own person she is becoming. It is so fun to chat with her about projects or plans and listen to her input. She also does not give up easily when she wants something, and I know she can accomplish anything she puts her mind to. Her and I occasionally bat heads lately as her opinions clash with mine more and more often (especially with regards to fashion). It's maddening and interesting at the same time. I know she is spreading her wings and trying to figure things out and what she likes and does not like and I am trying really, really hard to let her. Gosh. Being a parent is so difficult and the longer I am a mother, the less I think I know. Figuring out the best thing to do in any given situation is so very hard and confusing. 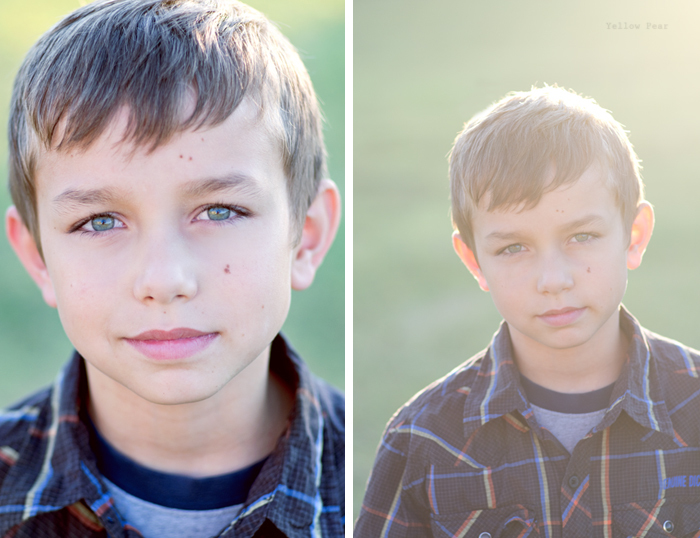 And then that middle little boy of mine. I am thankful for his great love for babies. He is just about the cutest thing whenever a baby comes around. He held my one-year old niece's hand and walked her around the house doing whatever her little heart desired. He played games with her. He stroked the side of her face every so often and patiently walked her from room to room for hours, stopping here and there to get her a new cracker. She absolutely ate it up (so did I). Also he wants a dog. The kids were discussing what kind of dog they would like and he said, "I want a Golden Leopard". Does anyone know where I can get one? So. Yes there are days when I am frazzled and crazy and I don't take a shower until 1pm and we have breakfast for dinner and the house is in shambles and nothing is perfect and orderly in the least bit (actually that's probably the case more often than not). But I really wouldn't change it. I love the hugs, and cards from school and the "You're the best" and playing dinosaurs. I just hope I survive and don't ruin any of my four kiddies permanently. Ah so many fun memories! I'm glad you came to Thanksgiving and made delicious luscious! That sounds like the sentence isn't complete :O) And I'm thankful you're the funniest out of the bunch, keeps us smiling! You're family is so sweet. And I love the pictures of the your sleepy head. You are awfully smart. To enjoy them at the age they are is incredibly difficult - especially when you're trying to just keep up with the laundry the grocery shopping and dinner! I personally believe that's why grandparents enjoy grandchildren so much - they don't have to do it all, all the time. You will be great at both!